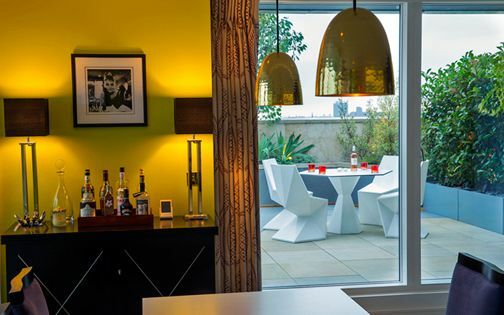 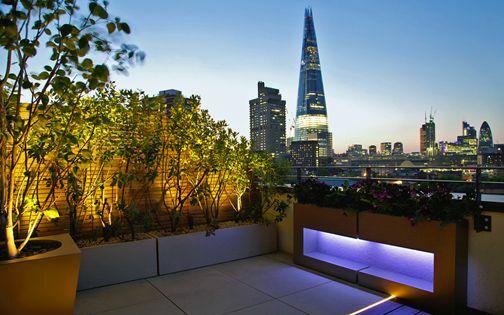 This contemporary roof terrace design envelops the curved Art Deco Ziggurat building, where an expansive urban vista under a clustered London skyline is enjoyed within a dynamic indoor-outdoor sequence. 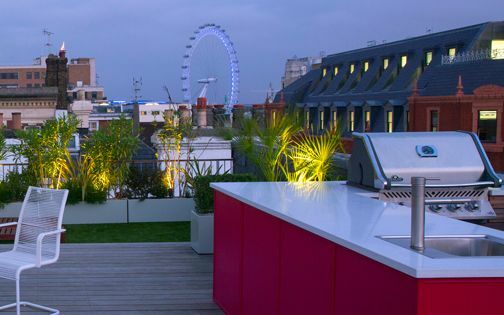 We focused on minimising upkeep and improving connective fluidity with city architecture to maximise roof terrace liveability. 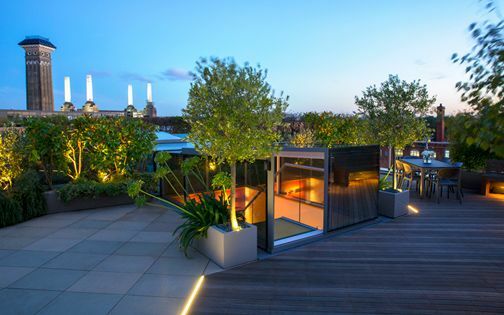 Hardwood decking increases sense of space, softened by grasses, Lavenders and Birch trees flourishing in a windy aspect, while bespoke planters, LED lighting and a highly detailed surface layout design complement the building's architectural outline – amid a shimmering London horizon. 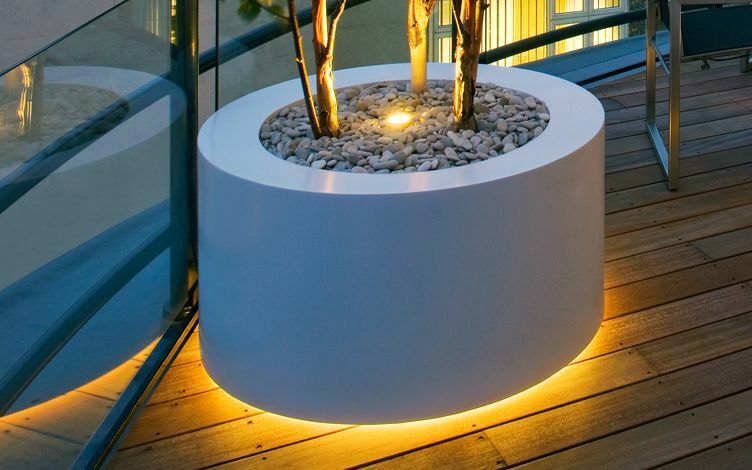 We designed a private, contemporary rooftop framework to enhance Ziggurat's expansive city panoramas, matching curved white walls with powder-coated roof terrace planters. 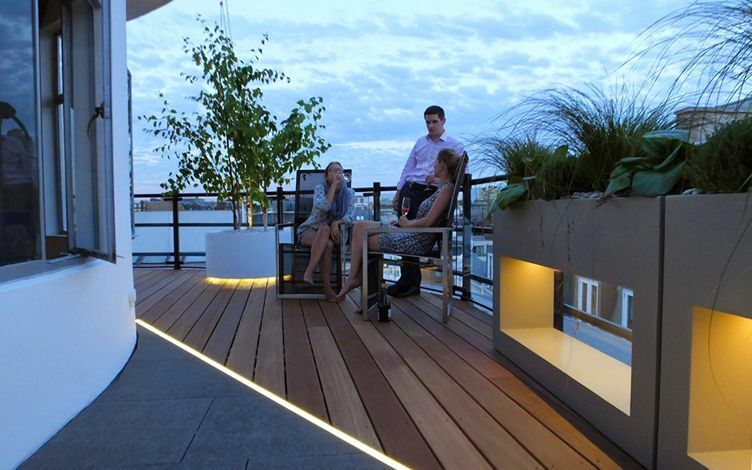 Hardwood decking merges fluidly with the apartment's unique interior design, while evergreen foliage augments in-situ Art Deco curvature to form integrated architectural elevations. 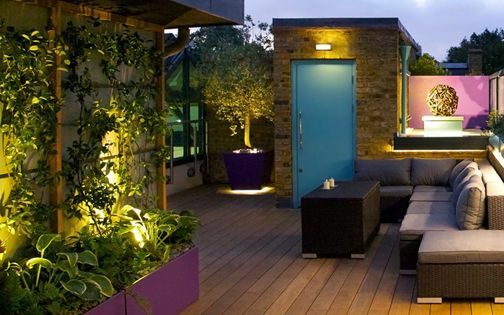 An effortless, natural material palette produces warmth across this roof terrace design, where intimate outdoor zones open sympathetically into a definitive London perspective, highlighted by crystal black granite pavers, while contrasted by a linear LED strip light. 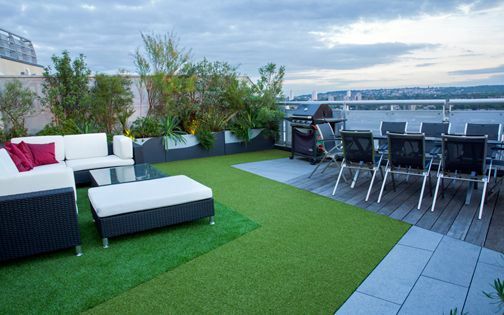 The minimalist rooftop design articulates a modern penthouse terrace approach, with elevated foliage and culinary herbs glistening in urban afterglow – generating dynamic ergonomics which enables easy use, and sustains minimal maintenance through the seasons. 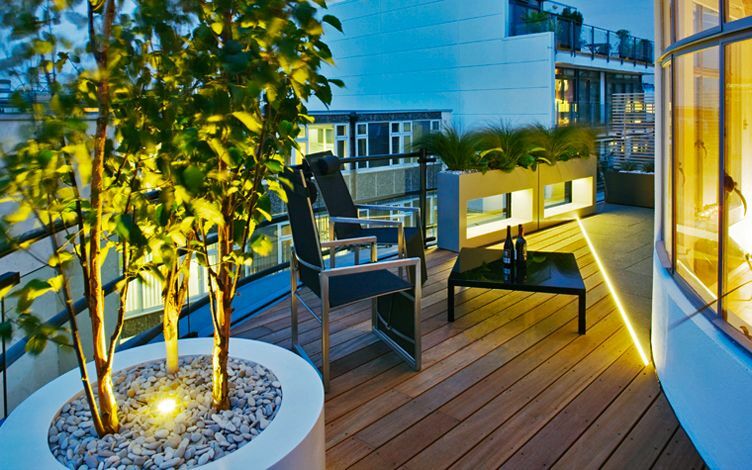 We included some of our favourite architectural trees, layered in contrasting textures, colours and clear scale. 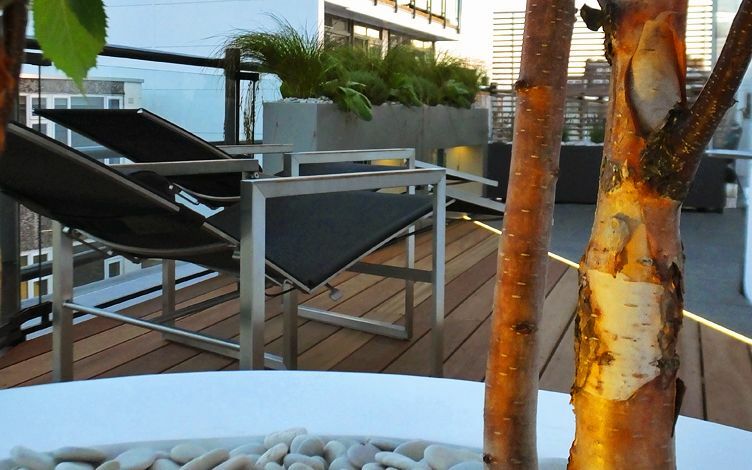 Betula albosinensis ‘Fascination’, the Chinese red birch, is a valuable selection. 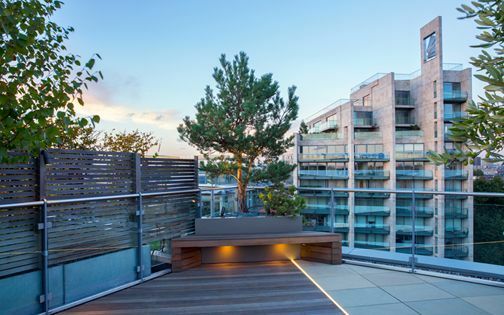 Having planted it on a 40th floor Barbican roof terrace, we knew it's wind-resistant, fast-growing and sculptural, where the tree's progress is noticeable at Cromwell Tower's apex, and to enable transporting tall specimen trees, we utilised a furniture lift to reach the 6th floor. 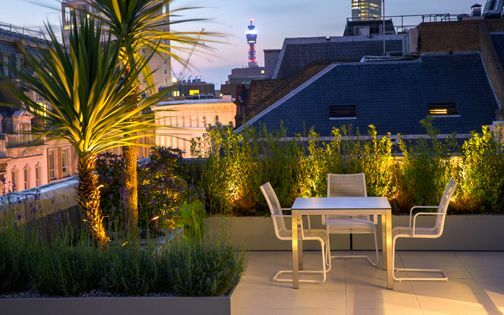 As many of our London clients benefit from homes containing both a roof terrace and a garden, we interweave reciprocal design techniques and concepts to form a progressive approach, and enhance intimacy within varied urban settings. 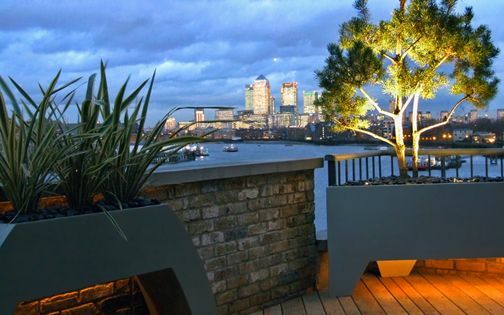 In this terrace, we extended innovative methods developed for a contemporary town garden to accentuate city panoramas with distinctive, custom-made aperture planters. 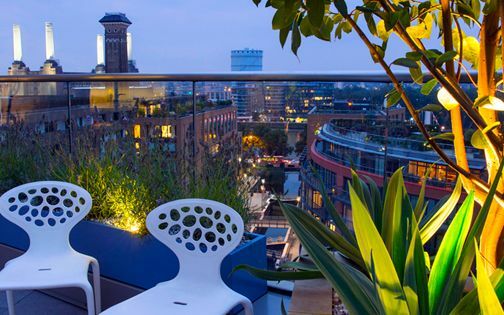 While the unique Ziggurat building adjoins a hectic Central London crossroads, its roof terraces generate unexpected, hidden bird's-eye views, amid a trendy outdoor space ambience. 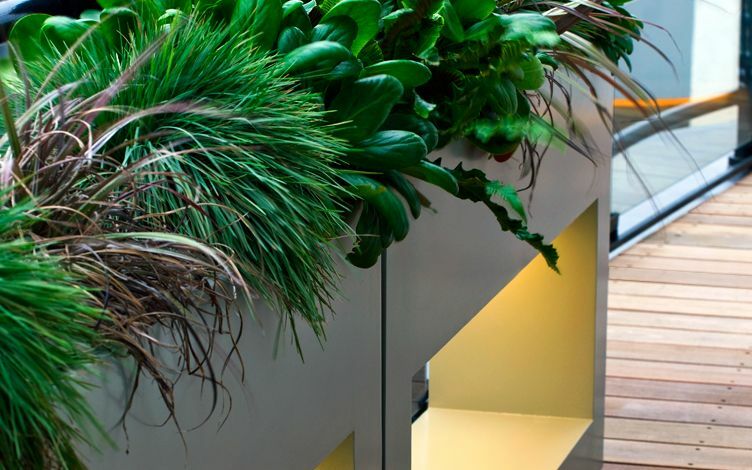 Architectural planters present multiple design advantages, and with highly efficient drainage and automatic irrigation, these contemporary troughs sustain optimal plant growth performance – defining an ultimate, free-standing roof terrace method. 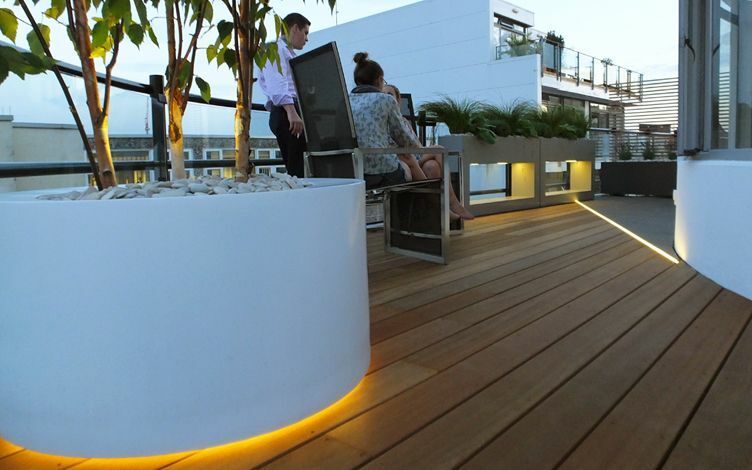 Attentively developing this original design archetype throughout our landscaped rooftops in London's Eastern Central area, we match patterns and outlines in every terrace scheme to produce fitted installations, where a connective design mindset fuses distinct contours, colours and textures with urban roof terrace environments, while enhancing purposeful ergonomics. 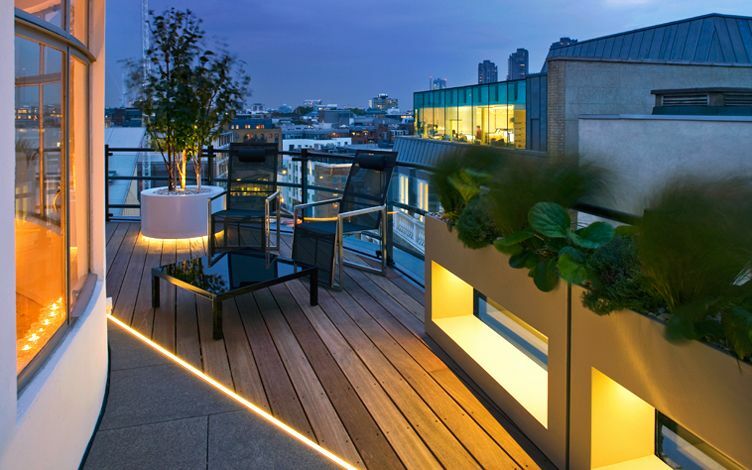 We continually shape novel roof terrace design ideas into working frameworks to distinguish individual clients, within London's surrounding city fabric. 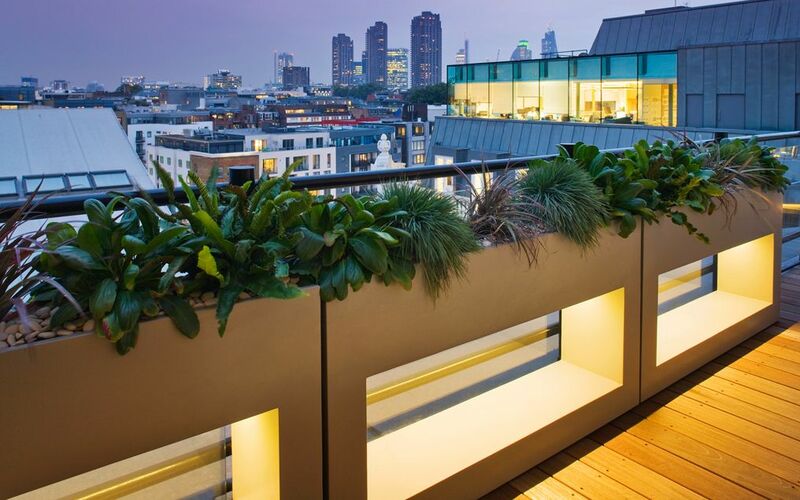 In many roof terrace design & build projects, appraising access is invariably paramount, as it may not be feasible to navigate long items logistically inside high-rise buildings. 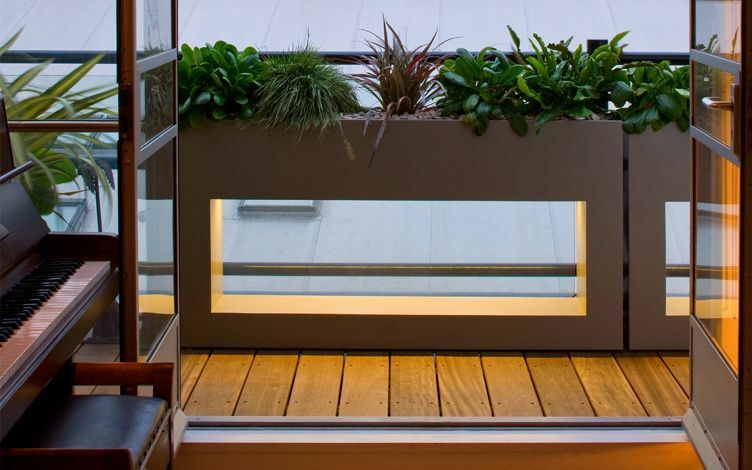 The lift is best checked for size, and all openings en route to the roof terrace measured for width and height. 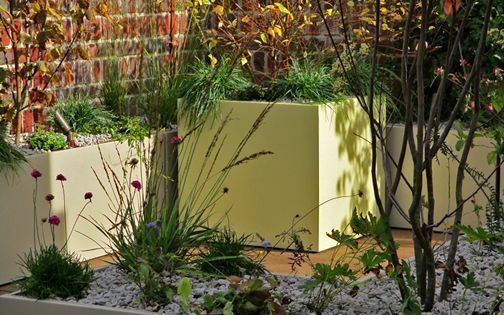 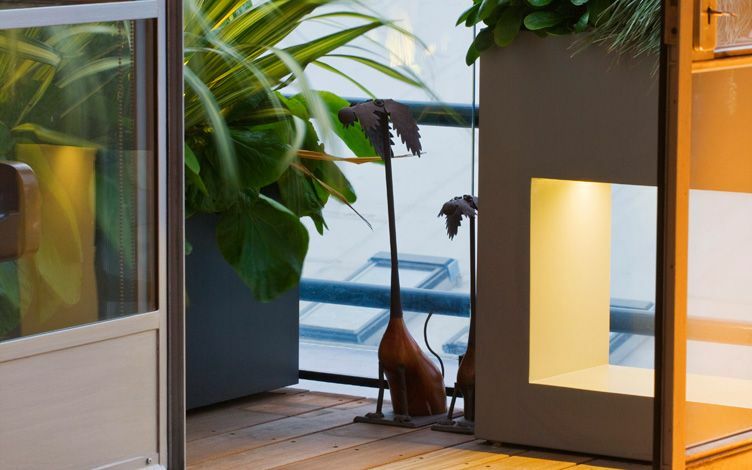 Larger planters are preferable on roof terraces, as they're well balanced, while compost retains moisture for longer. 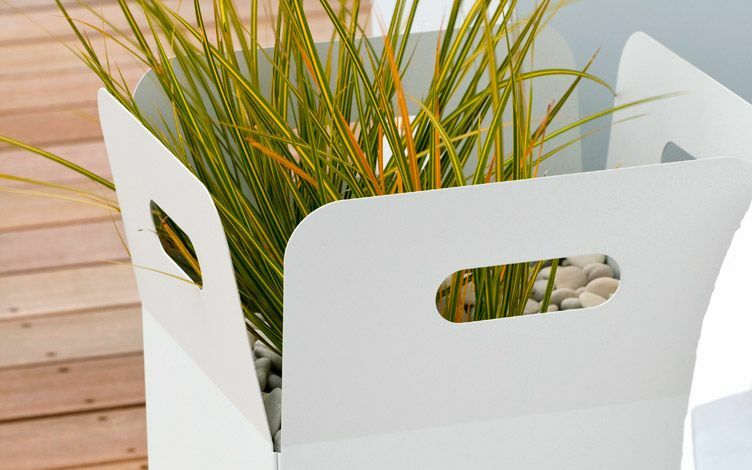 Ample drainage, discreetly integrated into containers, preserves cleaner surfaces, and performs its purpose out of sight. 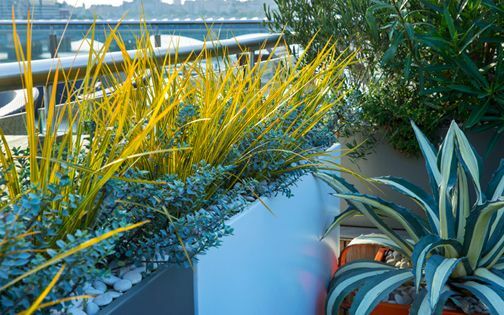 These effortless techniques sustain great sky-high gardens, where flora which wouldn't usually thrive in a garden's clay soil exceeds expectations in a roof terrace design. 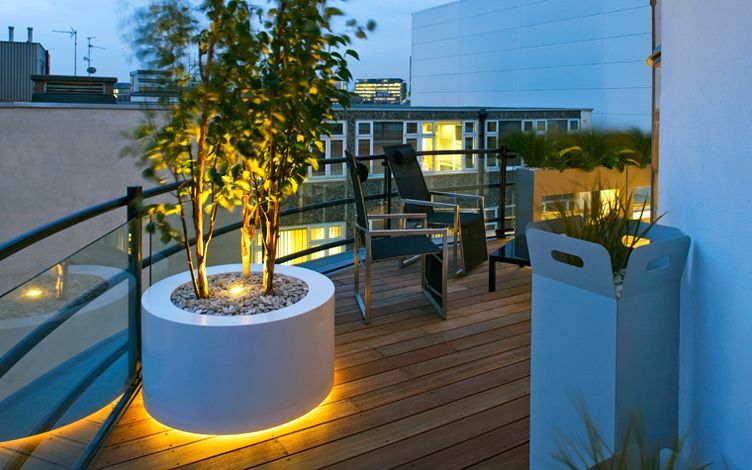 Lightweight drainage material at the planters' base, adequate flow outlets and suitable compost sustain diverse London roof terraces. 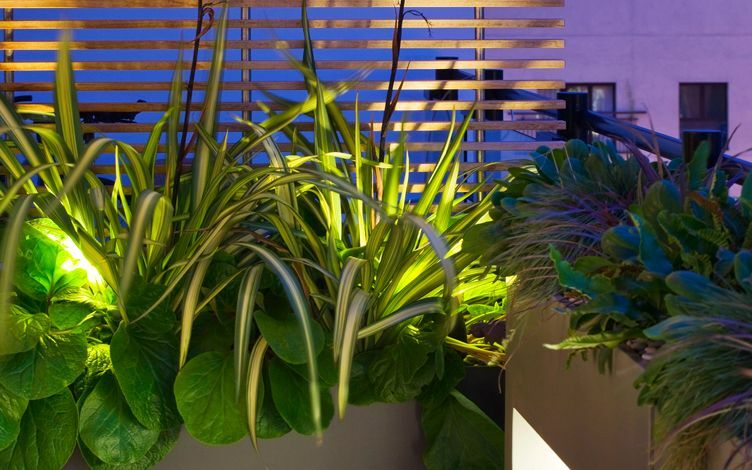 Gusty, altitudinous aspects entail low-lying, small-leaved and silver-leaved vegetation which adapts effectively in intense microclimatic conditions. 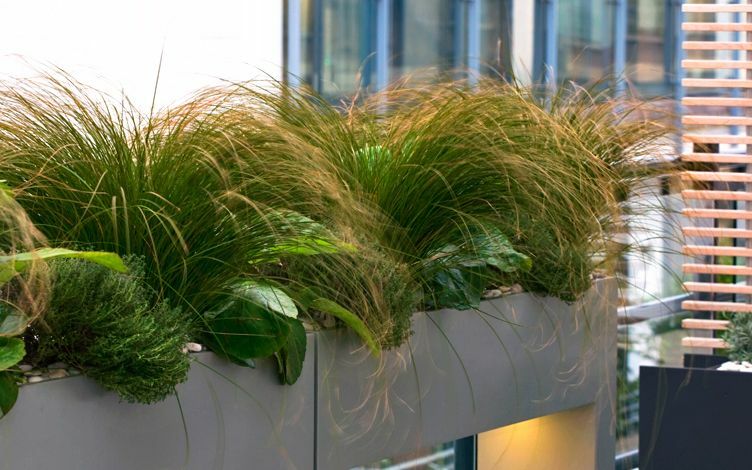 Automatic irrigation reduces manual watering and saves water, centrally pivotal in ensuring longevity within a well-designed roof garden, while efficient seasonal programming promotes robust plant growth when customised for each roof terrace design's varying environment. 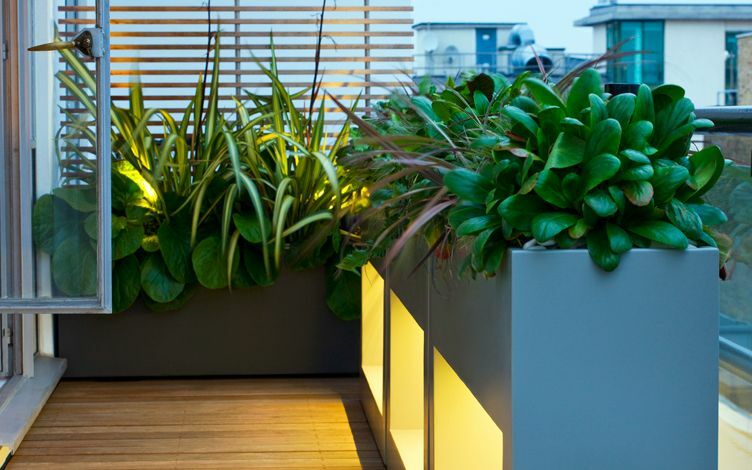 Since profuse pollution engulfs river roof gardens, we devise distinct matrices of suitable plants, planters and materials in optimal positions to outweigh a myriad of urban dilemmas – after all, greening our concrete wilderness is the only way forwards!